Is the floor an interior or exterior surface? What level of gloss is desired? What color hues are desired? What traffic will the floor be subjected to? What level of maintenance will be required? If the floor is an interior surface, the choice of finish is less critical than for an exterior surface that might be subject to rain, overspray from sprinklers, abrasive dust, sun, or other environmental factors that are more abusive than that encountered with an interior setting. 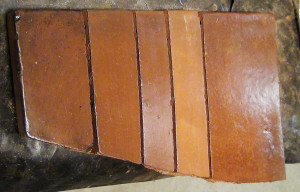 Because of the more abusive environmental factors listed above, and because of the hazards imposed by a wet, slippery walking surface that might be encountered on an exterior floor or deck, exterior finishes should have a frictional resistance, when wet, that minimizes the possibility of slipping. An exterior finish should also be resistant to deterioration due to ultra violet light from the sun, failure due to the action of chemicals found in pool water or agricultural treatments such as water-born fertilizer chemicals, and other caustic chemicals found in an exterior environment. 12×12 unfinished clay floor tileThe finished floor gloss level ranges from high gloss to completely flat. Between these two extremes is the satin wax finish which is most often specified. Gloss level is controlled by both the finishing product used and the number of coats of that product that are applied. 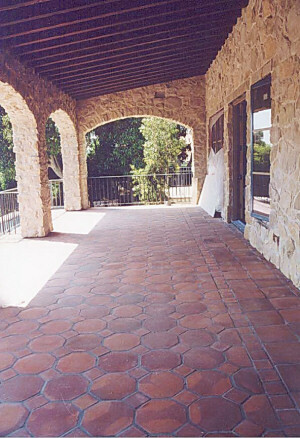 With a handmade clay tile, the unfinished surface can range from smooth to very rough, with rougher surfaced tile being reserved for those areas needing exceptional frictional resistance such as in driveways. 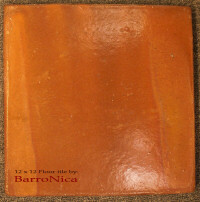 Sources such as BarroNica Building Products, Inc. (www.barronica.com) are able to provide this wide range of textures in response to usage specifications. The use of a final application of paste wax, on top of a multi-coat polymer finish, is a process by which the rich luster of a wax finish can be accomplished. This final coating of wax also yields a floor that is easier to maintain, as foot traffic develops walking patterns in the finished floor. A quick machine buffing and, where necessary, an application of a small amount of paste wax, eradicates the appearance of a traffic pattern on the floor surface. Tinted clay floor tileWhile the natural colors obtained from high temperature wood firing of handmade clay tile offer a rich range of hues, there are times when the installation calls for a tightening of that range. This can be accomplished by the use of a tinting compound either applied directly to the unfinished tile prior to finishing with a clear finish or mixing the tint directly into the first finish coat. 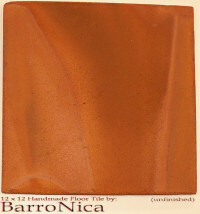 Testing on sample tiles is essential since, once the tint has soaked into the tile’s surface, it is very difficult to remove. It is recommended that the services of a professional tile finisher be employed. Whether these services are used or you attempt to do the finishing yourself, experimentation with different types of tints, as well as mixtures of different tint colors, is highly recommended. To develop a toilet far more attractive, rest room furnishings will be the fantastic decor accent. Usually the one solitary area that just about everyone visits at some point while in your house is, without a doubt, the restroom. To make certain that your washroom is authentic and distinct from all others, all you need to complete is highlight it with the greatest bits of decor and cabinetry. Home improvement is a necessary task in home maintenance, but you need to understand what you’re doing and have the right materials. There are many different stylistic choices, skills, and regulations influencing the way home improvements should be done. Use some of the suggestions in this article to tackle your home improvement project efficiently and safely. Employ a chimney sweep to inspect and clean your fireplace and chimney on a routine basis. …. To develop a rest room far more welcoming, bathroom furnishings could be the ideal decor feature. The one solitary room that virtually anyone visits eventually while in your property is, definitely, the restroom. To make certain that your restroom is unique and distinctive…. The dcor in your home says a great deal about the type of person that you are. Your dcor will determine the manner in which people perceive you. It is very important for all homeowners to carefully consider the current dcor in their home and to determine if it is an accurate representation of the person that they are. It is important that this dcor flows from one room to the next and that it truly makes a bold statement. The problem that most people have is d….